This has been a great fishing month in Steinhatchee. Offshore our captains have been busy with big amberjack and tons of red grouper. While the kingfish bite has been slow, reports have them working their way north to our area. 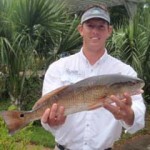 Inshore, the fishing has also been excellent, with full boards of redfish and trout. While the reds will occasionally shut down after a frontal passage, the trout bite has been spectacular this past month. Shane Rhodes and some friends from South Georgia came down for a weekend and caught multiple limits of trout before 11 AM, fishing around the Bird Rack to the north of the river. Thomas Benton, in Shane’s group, landed this nice 4.5 pound redfish as well. 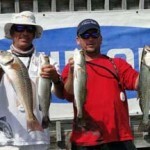 The rest of the pictures are from the Florida Lure Anglers’ Tournament on April 14th. Young and old scored well in this great event. May will be another fantastic fishing month. Red grouper and amberjack will continue to lead the way as gag grouper season is closed in federal waters until July 1. Everyone is also waiting for the red snapper season to open June 1. Our offshore captains will be very busy in the next few months, so please call and reserve your trip if you want to get to sample a variety of great offshore fishing. 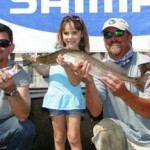 Inshore fishing will continue to be very productive. The flats are full of keeper trout in 3 to 6 feet of water over mixed bottom. Most folks have been scoring easy limits of fish using ¼ to ½ oz jigheads and Gulp shrimp fished slowly along the sand holes and grass patches. Try to avoid areas of solid grass, and keep moving if you don’t locate fish within a few minutes. When drifting the flats, make sure you use your Man Overboard marker on your GPS. When you come across a pod of fish, mark the spot so you can drift through it again on a later drift. For those traditionalists, a small weighted marker works great for this as well. Trout schools seek out areas of slight changes in depth or water flow that you can’t see from the boat, but there is a reason they are there, so it’s worth a return drift through the same area. Redfish have been a little finicky in terms of the bite, but they are there. A few trips this month we saw lots of reds that just weren’t interested in eating. Fish shallow rocky areas (around Rock Point and behind the Pepperfish Keys have been hot spots recently) with gold spoons, jigs or topwater plugs. There are some great new items in the Ship’s Store, including the new LiveTarget lures, some new Rapala and Yozuri hardbaits, and Sebile soft baits that are fantastic redfish lures. Whether offshore or inshore, keep a cobia rod handy because they are both on the flats and offshore structure. Spanish mackerel are beginning to get here in large numbers; find nearshore bait pods and chum near sand bars, or troll jigs or Clark spoons for lots of action…and don’t forget the wire leader. 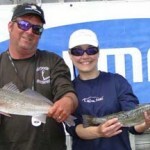 May 5: Optimist Club Saltwater Tournament (weigh-in at Sea Hag Marina, Econfina and Keaton Beach) PLEASE NOTICE: THIS YEAR THERE WILL BE NO OFFSHORE OR SPEARFISHING PRIZES FOR THE OPTIMIST TOURNAMENT; IT WILL BE INSHORE ONLY. 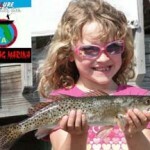 Lastly, we get frequent questions about the open seasons for fish in our area. Sometimes this is a challenge because they change frequently based on federal and state rulings. As of today, this is a list of the seasonal regulations for grouper, amberjack and red snapper. GAG GROUPER: State waters open April, May and June for Taylor, Jefferson, Wakulla and Franklin Counties. July 1 thru October 31 Federal waters open but STATE waters will be closed to above counties. BAG LIMIT 2 per person within the 4 Grouper aggregate bag limit, minimum size 22 inches. RED GROUPER: CLOSED FEBRUARY AND MARCH. BAG LIMIT 4 PER PERSON, MINIMUM SIZE 20 INCHES. AMBERJACK: CLOSED JUNE AND JULY. 1 PER PERSON, MINIMUM SIZE 30 INCHES FROM THE FORK. RED SNAPPER: NOT SET YET. LAST YEAR JUNE TO JULY 18, 2 PER PERSON, MINIMUM SIZE 16 INCHES.